Read Japanese Today is far from an authorative work on kanji, but it does what it sets out to do well. Every journey begins with one step. It is true for Japanese, and especially for learning to read Japanese. 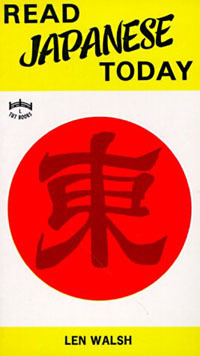 Read Japanese Today is a good first stepin that learning process. Despite several shortcomings, Read Japanese Today can help you to begin that long journey. The Japanese use two systems for writing (discounting the mess that is roomaji, or romanized Japanese). The first writing system they began to use was that of the Chinese pictographs, known to the Japanese as kanji. However, the first spoken Japanese came long before that. This lead to the interesting problem of each kanji having two pronunciactions, the Chinese one and the Japanese one (however, despite the wide variety of Chinese dialects and Japanese, people of different backgrounds could still communicate via the standardized kanji). Also, because of the major differences in Japanese and Chinese dialects, simple concepts had to be rendered in time-consuming kanji. Thus, in using Chinese, the Japanese had to graft it into spoken Japanese. They did this by simplyfing several kanji, so that they no longer represented ideas, but rather syllables. This created two syllabic alphabets, hiragana and katakana (known collectively as kana), in addition to the kanji. This is Read Japanese Today's first major stumbling block. Any Japanese kindergartner knows how to read kana (even if they don't know what the word means). It is an integral part of reading for any Japanese whatsoever. However, Read Japanese Today only contains a pair of tables and additional notes on kana; a seperate study would be needed to learn the kana characters. If the Chinese use characters for everything, there must be an enormous amount of kanji, right? Yes and no; the Chinese use kanji for everything (or most Chinese, anyway); however, kana gives the Japanese language much more flexibility (nearly any word from a foriegn langauge, like "terebi" for television or "koohi" for coffee would be rendered in kana, whereas it would take some kanji in written Chinese). However, modern Japanese people only (you know you've lost it when you say "only") know two thousand kanji (exceptions include doctors and lawyers) after graduating high school. The example given is that two thousand is the number of a literate adult able to read a newspaper. However, in Read Japanese Today's meager one hundred and fifty-nine pages can scarcely cover the vast number of kanji. In true "first step" fashion, it only covers the three hundred most important kanji. Finally, all the kana and kanji are composed of a number of strokes (lines; both were orginally written in brush strokes). For each character, there is a set order for each stroke to be written. Though it's not important in the Roman alphabet, the stroke order is intergal to the writing of Japanese. Read Japanese Today does not cover stroke at all. Though it does not claim to help at writing at all, some guidance in stroke would have been helpful. As it stands, the book is completely useless for learning to write. The reader is quite likely to outgrow the book before learning all the kanji, because it is much more efficent to read how to write the kanji as it is learned. So why does the book get an eighty percent? Depsite these shortcomings, the book sets out to do one thing: help one memorize the ideas that the kanji represent. It does so in a the format of a novel. In fact, the book is best read as a novel. It simply moves in a semi-haphazard fashion through three hundred kanji, showing pictures as to how the kanji represents the idea it illustrates. In some instances it goes to the orginal kanji, in others the author makes pictures that act as mnemonic devices to help in memorization. The book flows very easily. After reading it once through, it is surprising how much kanji is retained in memory. After my first read through, I was able to read the kanji for my friend, Nakamoto Rieko's name. In addition, I noticed that I could recognize several kanji that I hadn't known before. As an introduction to the most intimidating part of Japanese, Read Japanese Today is a great first step. However, it is just that... a step. One still needs information on kanji, grammar, and some solid kanji dictionaries to make it through Japanese. But as a handy little walk in the park, as it were, Read Japanese Today is worth the hour's investment.